Are Crash Diets As Good As Slow Diets? Did we believe in a myth when thinking slow and steady wins the race in sustainable weight loss? An Australian study says yes. Australian researchers took 204 obese adults and put them on either a 12-week rapid weight loss diet or a 36-week slow diet, with the goal for both groups being a body weight reduction of 15%. Half of those on the slow diet, but 80% of people on the fast diet reached the minimum goal of 12.5%. A clear win for the crash diet. In a second phase those who had lost at least 12.5% participated in a 144-week weight maintenance diet and again interesting observations were afoot. Both groups had a mighty hard time keeping the lost weight off and in the end about the same rate of success: 28.8% in the slow group and 29.5% in the fast group managed to stay at their new weight. A difference so small it’s negligible. The ~70% others gained back around 4 kg of their original average loss of 14 kg, no matter what group they were originally in. There are a couple of questions worth asking. First of all, how motivated to participate were the study’s subjects? As any researcher in nutrition can tell you, getting participants for dietary interventions that last for months is a formidable task. According to the paper, people were recruited in a Melbourne hospital, but we don’t know if they were already willing to lose weight or just happened to be obese and a bit coerced into participating. Motivation, after all, plays a huge part in losing and keeping weight off. People who self-motivated themselves on the road to slow weight loss from my experience not only thought their diet through, but also what happens afterwards. 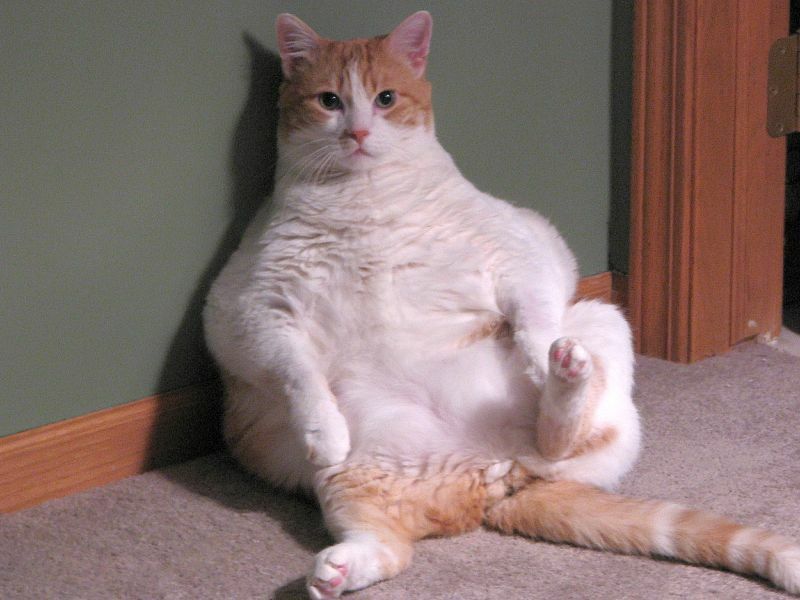 Pictures of cute animals are great, an old publishing adage goes, so at this point you get to see an overweight cat unmotivated to lose weight. If both groups were equally unmotivated, then the fast group already had a huge advantage: their crash diets lasted for only three months and they didn’t have to think about what to eat at all, as they received Nestlé’s Optifast diet drink mornings, noons and evenings. The slow group in general was left to its own devices about what they did. They could voluntarily drink Optifast once or twice a day and received some warm words about following the Australian Guide to Healthy Eating. I therefore draw a different conclusion from the equal weight regain in phase 2 of the experiment: two equally unmotivated groups have the same chance of keeping lost weight off, no matter how they lost it, because both no zilch about weight maintenance. Last but not least, when looking over the amount of work the University of Melbourne has done in weight loss research, it stood out to me how often Nestlé’s Optifast played a role. I could almost hear Nestlé say “thank you” and researched the study’s researchers. The last on the list, Professor Joseph Proietto, was its lead. He also happened to be the chairman of Nestlé’s Optifast medical advisory committee from 2005 to 2010 (see the disclosure at the end of this article (PDF)). I’ll take this study with a pinch of Optifast and wait for more reliable research before I withdraw my signature from what Nicole wrote: keeping the weight off requires rethinking how and what you eat. At this point I salute the Telegraph’s Victoria Lambert, who noticed the link between Professor Proietto and Nestlé, contrary to Larry Husten at Forbes, Karen Kaplan at the Los Angeles Times and many others. Despite my worst premonitions, good science reporting still shows a few vital signs. Pictures courtesy of Tony Alter and Dan Perry. This reminds me of what I’ve read about couples. Unlike the myth, those that jumped into a relationship fast did as well as those who took their time. As you say, motivation was probably the most important factor! PS: I’d started to write this up before I saw your review.